The VP-794 8-Input Universal Live Event Scaler and Switcher for Projection & LED Video walls is a flexible scaler/switcher for analog and digital video signals designed for driving large screen displays and multiple screen applications from video or graphic sources. It features two composite video, one S-Video, one component video, one VGA, one DVI, one HDMI, and one 3G/HD/SD-SDI video inputs. The VP-794 uses HQV (Hollywood Quality Video) Video Processing to up or down-scale the incoming signal as well as apply flexible warping, geometry correction, and professional grade edge blending to the 3G/HD/SD-SDI, DVI/HDMI, VGA, and S/PDIF outputs. The VP-794 includes dedicated LED video wall, projection, and general scaler/switcher operating modes. You can control the switcher using the on-screen display, front buttons, and jog wheel on the unit itself, RS-232, TCP/IP API and web server, and the PC-based Warp Map Generator tool. The VP-794 is ideal for professional, broadcast, and corporate AV applications, live events, rental/staging, and premium fixed installs. A power cord, DVI-D cable, and CD-ROM with PC tools come included. The VP-794 is suitable for professional video wall applications. It features four-sided edge drag and drop for sizing the picture to fit the LED screen, for simple system configuration. Supports warp mapping and edge blending as well as advanced geometry correction including rotation and portrait mode extraction. In this mode, the VP-794 features four-sided soft edge blending with multi-region black level correction for seamless blending of multiple projectors. It also includes flexible geometry correction functions to correct misshapen images and projector misalignment by dragging and dropping each image corner, pin/barrel rotation, or keystone and rotation. A PC application is included for easy warp map creation. Third-party generated warp maps can also be processed from automatic image alignment systems for projectors and curved screen tiling. 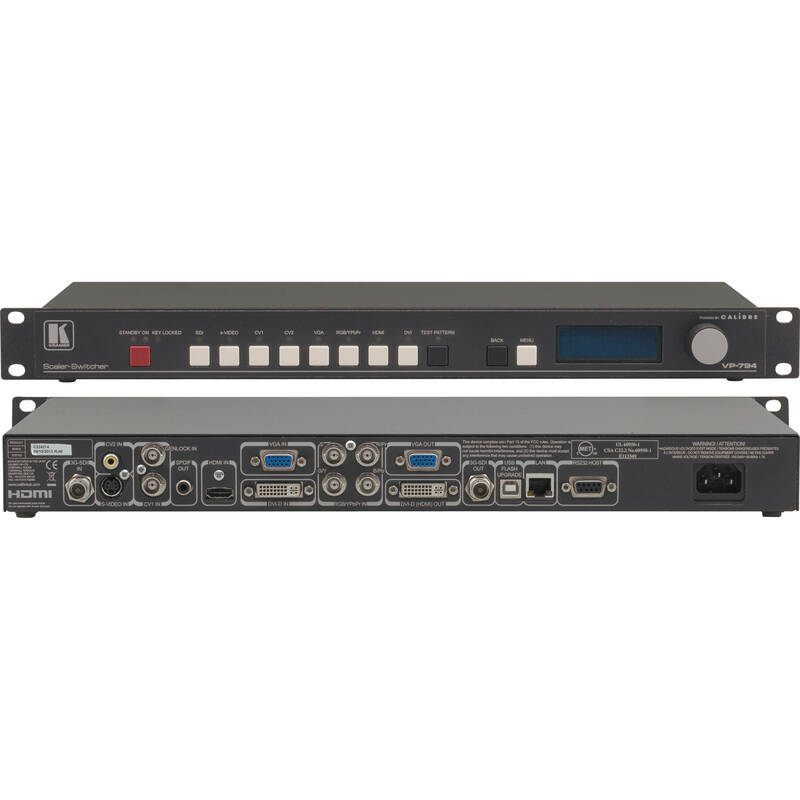 In this mode, the VP-794 becomes a universal scaler/switcher and scan converter for live events, broadcast and high-end fixed install applications. Ensures minimal picture lag, which together with 3G/HD/SD-SDI inputs and outputs and bi-level or tri-level sync genlock capability makes the VP-794 ideal for on-stage or in-camera use at live events. Worldwide Power Supply - 100 to 240V AC. Box Dimensions (LxWxH) 43.69 x 18.4 x 8.8"